When Riley Samels walks into Interbelt Nite Club and heads backstage, he’s a regular 20-year-old college student attending Kent State University. A half an hour later, after makeup, a wig and new clothes have been applied, he’s no longer living as Riley Samels. He now reigns as Becky, confident and unstoppable drag queen star. Lips painted purple and blue, Riley watches himself transform physically, creating a new persona on his skin. Although he looks unrecognizable on the surface, what Riley feels on the inside is expressed on the outside. Since October of 2016, drag has become a part of Riley’s weekly routine, performing locally in Akron. After playing with the idea of drag and testing out different makeup looks, he dove in head first and hasn’t looked back since. Born and raised in Akron, Riley Samels has spent the last 20 years in Ohio. Now a junior visual communication design major, he says he not only can’t wait for graduation, but to get out of Ohio entirely. “When I graduate, I would like to land some sort of job or internship at a company in Chicago for my daytime job, as well as the night life just because it’s more artistically appreciated in those areas,” Riley said. Walking on campus, Riley trots boldly and assertively dressed in trendy clothes that seem as if no one could pull them off but him. His swift step seems to come naturally, but only recently he gained that type of confidence. Riley identifies as a more introverted person, hiding behind a mask of sorts; however, Becky, his drag queen alibi, has allowed him to take off that mask. “If I screw up [as Becky], I can rub it all off at the end of the night, and nobody is going to associate Riley with whatever I just did,” Riley said. Riley’s friends and professors have witnessed a growth of Riley, internally and externally. Katherine raves about Riley as one would imagine a best friend does. She says that drag has helped Riley boost his confidence and further express himself, with a combination of several factors. Sara Frazee, another close friend of his for six years, met him during high school. She describes pre-drag Riley as a totally different person, keeping to himself and not talking about anything personal. She also notes that he had no interest in going out or doing anything social. Post-drag Riley can be deemed as a totally different person; he went through a superbloom. Sara also describes him as extremely artistic, which is one thing his visual communication design professor raves about. Professor Christopher Darling believes drag has opened him up to new patterns, styles and textures. Darling depicts him as strong-willed, theatrical, entertaining and compassionate. He learned about Riley’s drag queen career when someone called him ‘Becky’ in class. Darling remains proud that Riley is accepted and welcomed in the Kent State community. Drag not only plays a part in Riley’s personal life, but his school life as well. Opening himself up to drag and designing a new role for himself has inspired his artwork. One aspect we can all relate to is self-confidence and the long journey it takes to create a stable outlet that allows yourself to be comfortable with who you are and all that you do. 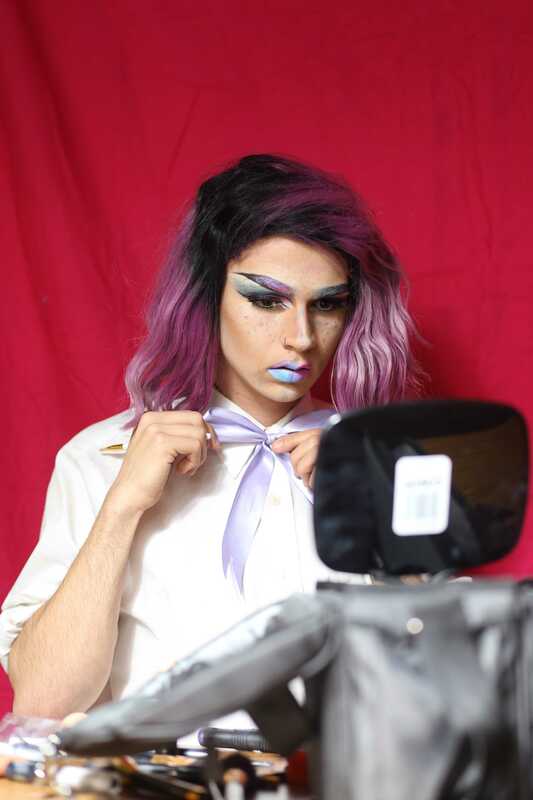 For Riley, drag has helped him escape that world of doubt and self-loathing and create a space of acceptance and self-love. The famous Drag Queen, RuPaul, once said, “If you can’t love yourself, how the hell are you going to love somebody else?” This has had a huge influence on Riley and rings true to home for him. Now, embracing Becky, his friend group has grown, as well as his self-acceptance and love for himself. To him, drag is an opportunity to put yourself out there without the repercussions of what other people are going to think, because at the end of the day, you can wipe it all off. “It should be taken as an opportunity to let those thoughts that you have on the inside that you probably shouldn’t say on the outside, but do it anyway,” Riley said.